Cold sores are a viral infection caused by the Herpes Simplex Virus-1. They are a recurring problem as the virus can lie dormant in our systems and reactivate when triggered. 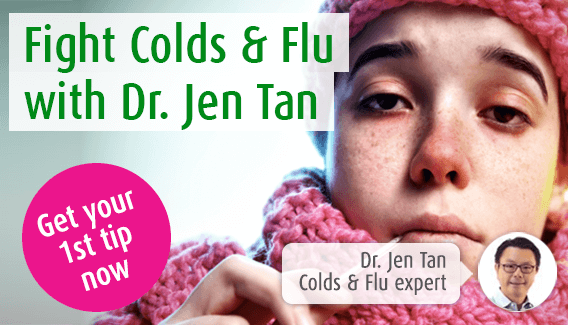 Here, our immune system expert Dr. Jen Tan shall address the causes and triggers of cold sores in order to provide you with the information you need to protect yourself against the infection. Cold sores are small fluid filled blisters which appear on the face around the mouth. They affect approximately 20% of the UK population. Cold sore symptoms include tingling at the initial stage of infection and pain when the sore fully develops. Cold sores are caused by the herpes family of viruses. They are a recurrent problem and the virus causing the problem can be triggered (re-activated) by a number of factors. This page describes the causes and the triggers for cold sores. For other information, read more about cold sore symptoms and cold sore treatments. HSV-1 is the strain which causes cold sores and is carried by over 80% of the population. HSV-2 can also cause cold sores but this is extremely rare - this strain is mainly associated with genital herpes. The first time a person comes into contact with HSV-1 is known as the primary infection. This can and often happens during childhood or during early teens and does not tend to cause any symptoms. Following the primary infection, HSV-1 lies dormant or inactive in the body but has a habit of lying within or near to nerve cells. The cold sore virus can lie in this state for years or even decades, becoming active following an encounter with a ‘trigger’. The virus is reactivated, leading to what scientists term the ‘secondary infection’ and the appearance of a cold sore. Hence, all cold sores are secondary infections. As the virus causes inflammation close to nerves, one of the most prominent cold sore symptoms, apart from the embarrassment of a prominent sore on the face, is pain. Many of these triggers have one thing in common – the immune system becomes weakened, which in turn causes a reduction in the body’s natural defence mechanism, giving the viruses a greater chance to ‘come to live’ and become active again. Looking for a natural lip care product? Bio Propolis - Lip Care Ointment is incredibly soothing, plus it forms a protective barrier on the lips. To find stores in your area that sell Bio Propolis, simply type your postcode below. Lip care ointment containing propolis. An introduction to the causes of cold soresIs the summer sun causing your cold sore?Cold sore triggersCold sores: new news for an old problemWhy do I keep getting cold sores? An introduction to cold sore treatmentCold sores bee goneHow to get rid of cold sores. Can someone give another person a cold sore when they have never had one before? I have a cold sore on my nose, and inside of the nostrils. Had this before? How do I get them and why? How can you prevent cold sores and is there an injection to prevent them?